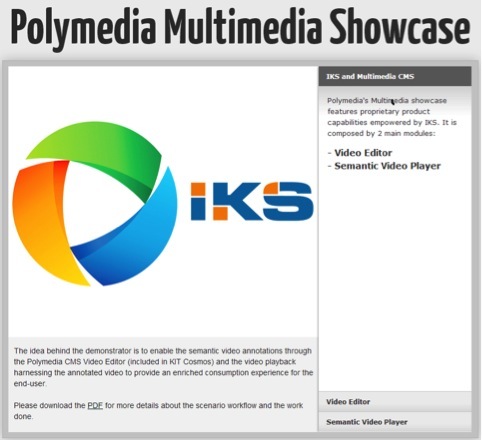 Polymedia is proud to announce that the Multimedia showcase page based on the proprietary KIT Cloud video editor mainstream product empowered by IKS’ video semantic annotation functionalities is now available at the following URL: http://demos.polymedia.it/iks/polymedia_showcase/. Please take a look for more details. Very briefly: the Multimedia showcase is composed of two main modules: the Editor and the Semantic Player. Both have been used during 2012 for demonstration purposes in a number of industrial events that Polymedia joined. Since the Editor is based on a proprietary product, the KIT Cloud CMS suite, deployed on a production environment, we’re prevented to make it available to everyone. Nevertheless, if you’re interested, we can manage to grant you access to the platform or arrange an online demo. Please, don’t hesitate to contact me should you need further details.